Holding on to me so tight. Baby, all I want for Christmas is you. This is our 5th Christmas together. I know, right?? I just had to go back through my blog to see if I had miscounted, even though I was counting on my fingers. But yep, our 5th Christmas. Even though I told him that all the Arcade stuff he got me is present enough, he still wanted to get me something else. I am easy to buy gifts for because I truly appreciate anything people give me. But I’m also quite hard to buy gifts for because I blog for a lot of my favorite stores already, plus I shop quite a bit on my own! So when he wants to give me something, it has to be something I wouldn’t normally buy for myself. Today Maitreya released their new mesh body. As soon as we signed on tonight, he dragged me down there to buy it. 🙂 I was planning on demoing it at some point but I already have the Slink Physique and only seem to wear that when I’m wearing things that show my legs. And not to mention that Pink Fuel doesn’t have appliers for it yet. But he didn’t care. He said it could sit in my inventory if I wanted, but he was buying it for me. We went home and I played around with it. I don’t wear Glam Affair skins [which are already preloaded into the HUD], but I happened to have some old ones from an event last year, plus the Slink appliers for one of the tones. It’s really a very nice body, and I like the alpha options. But until Pink Fuel does appliers for it, it’s not something I’ll wear often. Plus, let’s face it. I wear a lot of big sweaters and jeans. There’s basically so reason to wear a mesh body when you’re wearing that stuff. But there are good reasons to have mesh bodies, too. Like when you want to wear pretty, skimpy clothes while smooching on the man who has been good to you for 5 Christmases. And while you kiss him, you make your Christmas wish that there will be more Christmases together in the future. The girls have been itching to get a Christmas tree up, so tonight we headed out to Inglewood’s Farm to cut our own tree down! The place is really lovely and there are things to do and see out there. After we stopped at the little cafe to get coffee, we headed out into the tree farm to look for the best one. The girls ran around until they found the tree that they felt was the fluffiest. Luckily, Daddy Z is pretty handy with an ax. And he’s big and strong, because you know, we’re delicate girls. We couldn’t lug the tree around ourselves! We might get splinters! But he chopped and chopped and got us our tree. After we got our tree, met some reindeer [Birdy shared her coffee with them! ], and Abby met a woman who probably didn’t realize that wearing pants is usually a good thing out on a snowy farm, we headed home to set up our new tree. There is still tons to do in the house to get it ready for Christmas, but we got our tree up, so that’s really what counts. But setting up a Christmas tree is hard work! 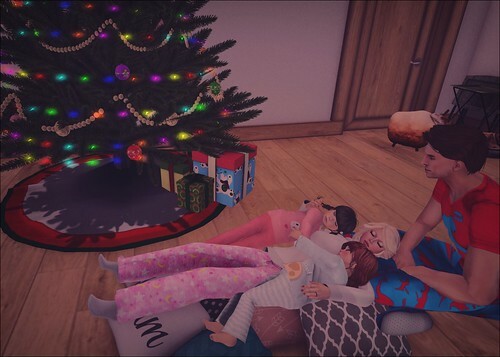 It was bedtime for our little ones, but they didn’t want to stop looking at the tree. 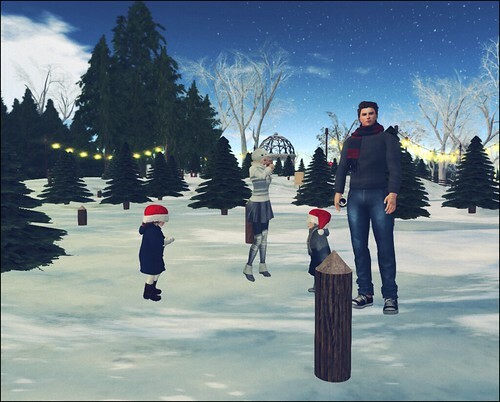 I love decorating for Christmas in SL. It’s soooo much easier than doing it in RL, don’t you agree? 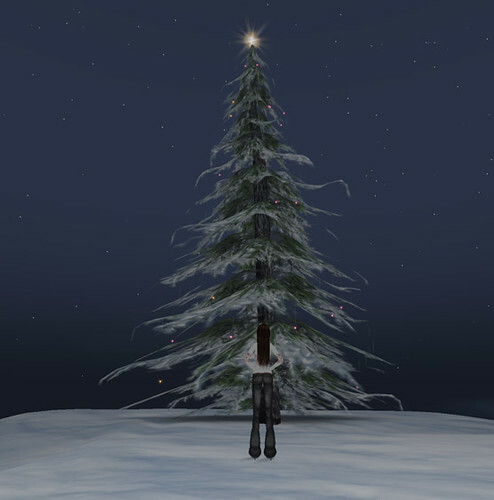 In RL, my tree is in a box still sitting in the corner. We can’t have a real tree because I have stupid allergies, so it’s always the fake tree. But ugh, that’s such a pain to put up, you know? All the little branches, all the trying to get the “needles” fluffed up. It’s pretty tedious. And THEN I still have to decorate it!!! No, it’s much much easier to decorate in SL and if I’m not careful, I’m going to use all the prims inside the house and have nothing left for the ice skating rink and winter park I’m going to put up on the other side of the parcel. 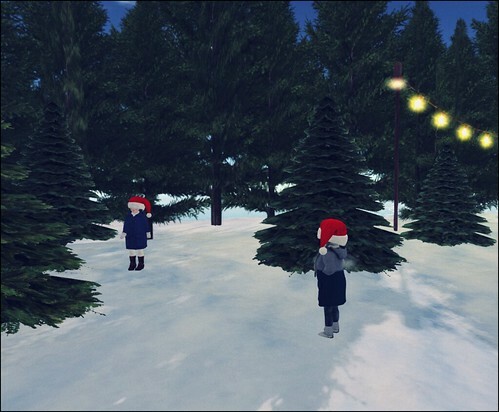 I need to find lower prim Christmas decorations! I mean, everything I put just IN the fireplace probably comes to over 100 prims. But it’s pretty, so… yeah. I need to find something for the top of the fireplace. I think I might have to get some stuff and rip it apart and smash it together to get the look I want. But I’ve been doing that with other stuff, so it doesn’t matter. Snow is in the forecast for Bluebonnet this week. Good thing we’ve been stocking up on sweaters!! Al went to bed and I’m itching to go back to playing Dragon Age [yes, again, for the 50th time. But I’m playing DA: Awakening this time because I’ve never finished it.] so I think it’s time to wrap this up, shut off all my IM things, and get into the game before I need to get in bed. I’m going to bed early tonight, but I had one thing to say. I love Santa and the new gingerbread house!! Posted in Christmas, friends, group chat, island talk, LOL, pictures, WTF Is In Ali's Head? So I had to keep myself occupied tonight since I was on my own. Rather than sit and pout [much] about it, I decided to get to work on the island. I want lots of Christmas decorations and wintery type things! First, I took the party deck and shot it up about 300m in the air so we could have more of an area to put decorations and stuff down. But then that left me with wondering what to do about the fishing. Then it hit me. Ice fishing! Of course, I think ice fishing usually involves a small hole, but um…this is special ice fishing? :-p It’s a cute little area, anyway. My response was, of course, a very short, “No.” She didn’t ask again. I’m guessing she was hitting up everyone in there for money. Rude. Sehra Kauffman: dang it is so too long and it wont shrink…. Alicia Chenaux: that’s not what he said. Sai Pennell: you guys have no clue how quotable you are. Meara Deschanel: wait, you liked Merrick’s balls on your rack? Bone Mosten: OMG being named the hottest male av is the. best. thing. ever! But I still need so much more Christmas stuff!!! I know what I really want, but I have NOT been able to find it. I don’t want to ask yet where to get one, just because I want it to be mostly a surprise, but I may end up having to ask. LOL It’s just impossible to find a great one. That’s my evening so far. I’m going to play a few games while I listen to Christmas music on the island and then head to bed.